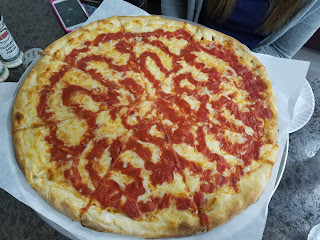 Gerry's Pizza has been on my radar for years because of numerous recommendations from the #NEPAnation readers. It's always a challenge for me to get to Wilkes-Barre because I don't get down there often, and many times when I do, I'm either working or with a group of people that I can't drag on one of my pizza crusades. 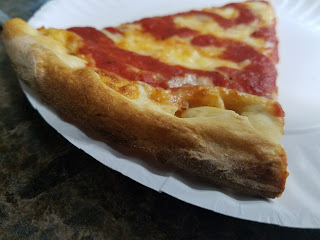 Luckily, I do have the First Lady of NEPA Pizza to drag along on the trip with me and we had a free night to hit up one of the places left on my longstanding hit list! So we loaded up the pizza mobile and headed south. We were there in no time, and when we pulled into the parking lot at about 8:30 pm on a Friday, we noticed the place was slammin' busy. After parking the car, the First Lady pointed out that they had a Pizza Drive-Thru window that was really cool and a unique feature to the NEPA pizza scene. We walked in to find that the place was pretty big and had a pick-up area with a few tables that you could dine at and a full dining room on the other side. I love pizzerias where you can see the pizza makers in action, and I had a great view of this fantastic assembly line at work. The pizza makers were working furiously to see one of the most loaded ticket order boards I've seen and their process was like poetry in motion. They had special pizza peels for each size of pizza, a person to stretch the dough, a person to apply the sauce, and a person to cheese the pizza. They even had this cool little sauce hose to squirt sauce on the top of the pizza! After staring awkwardly fascinated with the process, we headed to the dining room (for the record, the first lady wasn't staring awkwardly - she's normal, I'm the strange one!). I was shocked to see that the dining room had it's own pizza counter complete with pizza ovens which was really cool. This place was a proverbial pizza factory! They had pizza makers and pizza stations all over the place! They needed them all too, because the dining room was filled, the drive-thru had a line of cars, and the take-out side was full of people waiting eagerly to get their Gerry's fix! All of a sudden I started to realize why so many people had recommended this place to me. 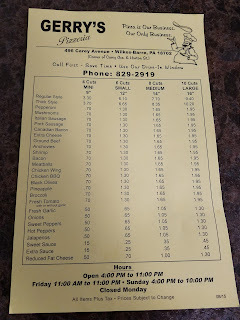 When it came to ordering, I heard about the sweet sauce at Gerry's, but I'm not typically a fan of sweet sauce, plus I like to go for a pizzerias standard specifications at each place, so we went with the regular sauce. 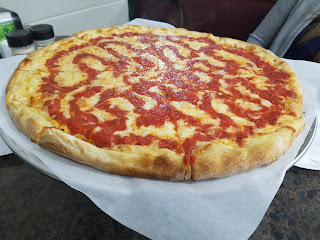 After a little wait, the waitress brought our pizza out and it looked great with steam bellowing from the sauce rivers which ran through the cheese. We each grabbed a slice and gave it a try. Our first reaction is that they are pretty generous with the cheese here which we appreciated. 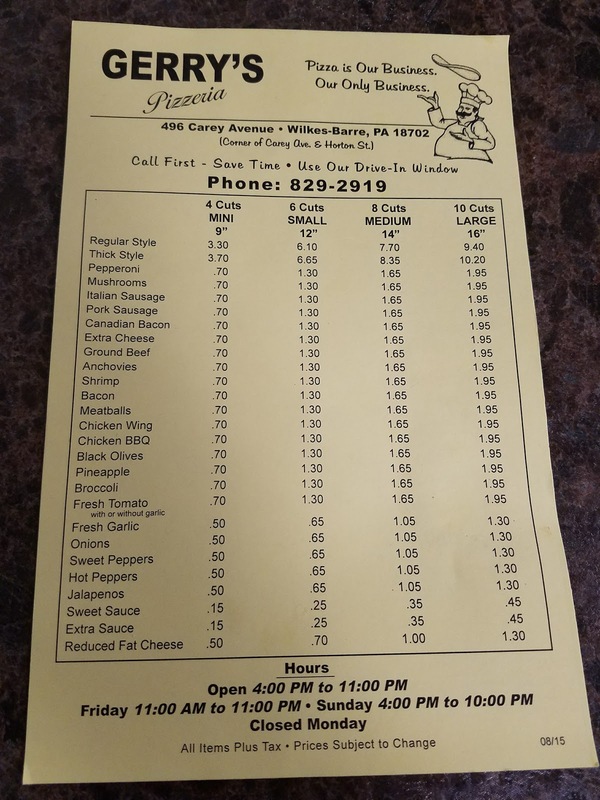 Having the sauce on the top is not unique in the Wilkes-Barre area or in some places near the Jersey Shore, but this "sauce squirting" is quite unique to the rest of NEPA and I presume the rest of the USA. 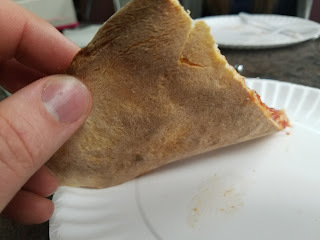 The crust was in the "cracker-crust" style like a Sabatini's, Grotto, or Angelo's. A cracker crust is a little flatter, more dense, and generally a bit tougher than your traditional New York Style crust. This crust was true to that definition. The flavors were pretty good, but the regular sauce sort of got pushed to the background because of the dense dough and generous amounts of cheese. The first lady and I both concluded that this is probably the reason why people order the sweet sauce and toppings on Gerry's Pizza. We looked around the dining room, and just about every pizza was a specialty pizza with toppings or special sauces on them. We also overheard a few nearby tables request the sweet sauce. Overall, I'd say we enjoyed the pizza, especially at the bargain price of $7.70. I think I enjoyed the restaurant itself the most. I loved watching a small business being so busy, and having such a great process and so many eager fans ready to feast on its saucy goodness. On the way out, we committed to come back and get the sweet sauce pizza next time. 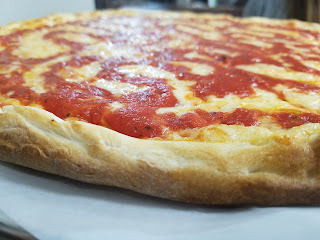 I highly recommend that you get to Gerry's Pizzeria soon and let me know what your experience was like because we certainly had a great one! I don't know the age of either place Gerry's or Stuccios in Berwick but Stuccios has a sauce squirter. They've had it for as long as I know. Might be worth the trip for a review. If you haven't been there. Also the Berwick Brewery has good pizza. And don't forget Tuzzis and Dalos.